While no one wants to think about the end of their life, most people want the assets they’ve acquired to benefit others after they die. The best way to ensure your assets are distributed according to your wishes is proper estate planning. In fact, proper estate planning is one of the best gifts you can give to your loved ones, helping to provide for their future, while minimizing taxes and saving them time and money. The four most important estate documents your estate planning attorney should draft for you are your Will, General Power of Attorney, Healthcare Power of Attorney, and Advanced Directive (Living Will). These documents indicate your personal desires regarding asset distribution, as well as business decisions during periods of incapacity and end stage medical decisions. When choosing an estate planning attorney, it’s important to choose someone with sensitivity to the importance of these documents and the impact they have on your family and others in your life. At Daley Zucker we’ve been helping families navigate the complexities of estate planning for over 50 years. Our Harrisburg law firm, features three experienced estate planning attorneys who specialize in estate planning and administration. Get the peace of mind that comes from getting your affairs in order, no matter what your age. It’s never too early to begin planning for the future. Put our experience to work for you! Handling a loved one’s estate on your own can be overwhelming, but you don’t have to do it alone. At Daley Zucker our team of estate attorneys specializes in assisting families probate the deceased’s Will to follow their wishes and distribute their property after death. We understand that you’ll have many questions regarding the process. You can count on our team to answer those questions and walk you through the process with ease. Our law firm provides three convenient locations to serve you including our East Shore office in Harrisburg and our West Shore offices in Lemoyne and Carlisle, PA. While estate planning is important for everyone, it is essential for older or disabled adults who often face challenging situations when it comes to their care and future financial planning. Our attorneys are well-versed in elder law matters including guardianships, health care planning, long term care options, Medicare and advanced directives such as Living Wills and durable Powers of Attorney. We can also work with families to uphold the rights of their loved ones who are residents of long-term care facilities and nursing homes. Having a conflict over the family estate? Avoid a court battle, save on legal fees and preserve your relationships with your loved ones by resolving your differences through mediation. 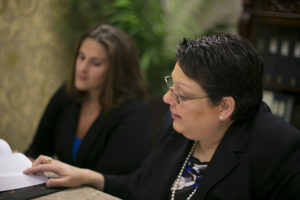 Attorneys Patricia Carey Zucker and Vicky Ann Trimmer are both trained in estate mediation. They can help you through the process step by step!